The United Federation of Planets in the time of Star Trek Online isn't beyond adding the odd Ferengi or Klingon, as long as the price is right. How much would you pay for the privilege? 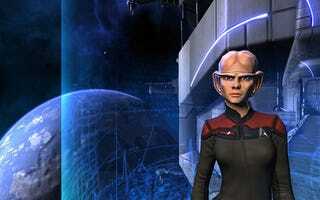 Star Trek Online launched today, and players are flooding the server with new characters. While the Federation has a nice selection of playable races (along with the ability to create a custom race), two selections are absent from the menu at first. To play a Federation Klingon or Ferengi, you'll have to visit the in-game C-Store. C-Store is short for Cryptic Store, where you spend "Cryptic Points" on game add-ons. Right now there are only two entries in the store, as seen below. Rather than go with the easy-to-understand one penny equals one point equation, 100 points equals $1.25, meaning a Klingon character (not counting the ones playing on the Klingon side of the game) will run you $3, while the Ferengi have cut a much better deal, costing only a buck. It's a growing trend in MMO titles, offering addition content at a cost, while still maintaining a monthly fee. Sony Online Entertainment has been doing it for a while, and Blizzard started back in November, when the company added in-game pets for World of Warcraft to the Blizzard store. I'm not sure how I feel about this. Both races have special abilities, but nothing that couldn't be purchased on a regular character, so the differences are mainly cosmetic and role-playing related. What does disgust me is the Ferengi female's vulgar display of clothing. I say we petition the ESRB to reevaluate that T for Teen rating.